This month we talk with artist Bobbi Bailin about her exhibit at the Maser Gallery. The exhibit is titled "Dancing on Paper" and all the pieces were made from hand-made paper, leaves, and other natural materials. We sat down with the president of the Cape Cod Canal Chamber of Commerce, Marie Oliva to discuss the upcoming Scallop Fest 2014. This year the Scallop Fest has moved to the Cape Cod Fairgrounds from Bourne Park where it has been held for the previous 44 years. We talk with Anne Connolly Saganic of the Falmouth Housing Trust about some of the projects she is currently working on including the Odd Fellows Hall project. We talk with Skating Director Deb Fernandes of the Falmouth Figure Skating Club about the history of the club as well as the upcoming season. We also talk with one of the skaters before the Summer Skating Exhibition began. We talk to Eddie Doyle one of the Founders of the Falmouth Walk. Eddie talks about the history of the walk from the beginning as a small fundraiser to the large event it is today. We talk with Annie Dean at Highfield Hall and Gardens about the recent Yarn Bombing on their property. The trees are actually only the entrance to the other art in nature exhibits that they have around the property. The September 2014 'FCTV Presents' is Online NOW! 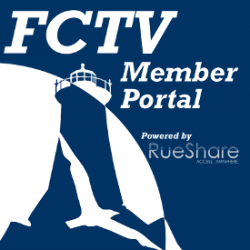 The September 'FCTV Presents' is now available HERE! More... about The September 2014 'FCTV Presents' is Online NOW! The 42nd running of Falmouth’s World Famous Road Race, from Woods Hole to Falmouth Heights. This year’s broadcast features footage from the starting line on Water Street, including Joan Benoit-Samuelson’s opening comments, both the Women’s and Men’s press trucks along the race, and the exciting finishes: Stephen Sambu’s dominant performance; the three-way battle between the Women’s leaders Betsy Saina, Gemma Steel, and Molly Huddle; and the record-breaking wheelchair finishes of James Senbeta and Tatyana McFadden. Artwork by Bobbi Bailin will be on display at the Maser Gallery at Falmouth Community Television from September 2 through September 25, 2014. The show is entitled “Dancing on Paper” and the public is invited to the Opening Reception, Sunday, September 7, from 3:00 to 5:00PM. This Exclusive takes a look at the new Research Vessel Sikuliaq, which was in Woods Hole at the Oceanographic Institute to be configured for her Maiden Voyage. The Sikuliaq (an Inuit word meaning “young ice”) is part of a new fleet of academic research vessels funded by the National Science Foundation. The Sikuliaq will be able to take scientists and their equipment deeper into the Polar regions not possible with previous ships due to thick ice.